L. Carbery against Birmingham & al. 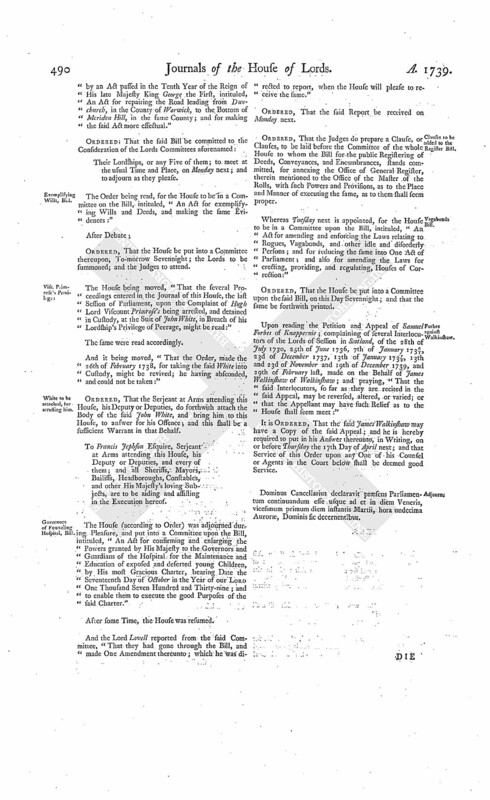 The Answer of Edward Birmingham and Abigail his Wife and others, to the Cross Appeal of George Lord Baron of Carbery and others, was brought in. As was also, the Answer of Alexander Watson of Glentarky, to the Appeal of Patrick Davidson of Woodmiln Esquire. 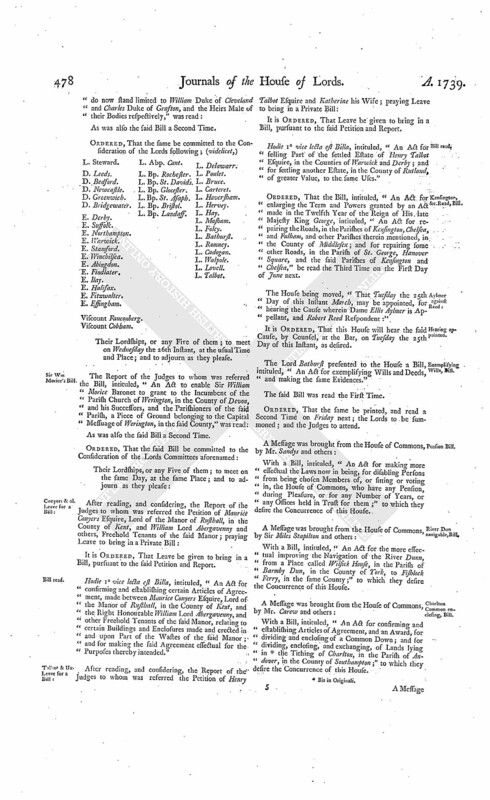 List of the Peerage of Scotland, delivered. The Lord Chancellor acquainted the House, "That he had received, from the Lords of Session in Scotland, their Return to an Order of this House, of the 12th of June last, requiring them to make up a Roll, or List, of the Peers of Scotland at the Time of the Union, whose Peerages are still continuing." King's Answer, concerning the Articles of War. The Earl Fitzwalter reported, "That the Lords with White Staves, pursuant to the Order of Friday last, had presented to His Majesty the Address of this House, for the Articles of War intended to be established for the Year ensuing; and that His Majesty had been pleased to say, He would give Order to the proper Officer, to lay the same before the House accordingly." The House being informed, "That the Secondaries of the Two Compters attended:"
"The Return of the Secondary of The Woodstreet Compter, to the said Order. "And also, an Account of the Protections and written Certificates entered in the Office of The Poultry Compter." The House was informed, "That a Person from the Sheriffs of Middlesex attended." He was called in; and delivered, at the Bar, pursuant to the said Order of this House, of the 29th of February last, their Return to the said Order. And then they (fn. 1) were directed to withdraw. Birmingham & al. against E. Shelburne & al. The House being moved, "That a Day may be appointed, for hearing the Causes wherein Edward Birmingham and others are Appellants, and Henry Earl of Shelburne and others are Respondents, et è contra:"
It is Ordered, That this House will hear the said Causes, by Counsel, at the Bar, on the First vacant Day for Causes after those already appointed. The like Motion and Order, for hearing the Cause wherein Patrick Davidson is Appellant, and Alexander Watson Respondent, on the next vacant Day for Causes. As was also the said Bill a Second Time. Viscount Cobham. L. Abp. Cant. Their Lordships, or any Five of them; to meet on Wednesday the 26th Instant, at the usual Time and Place; and to adjourn as they please. Hodie 1a vice lecta est Billa, intituled, "An Act for confirming and establishing certain Articles of Agreement, made between Maurice Conyers Esquire, Lord of the Manor of Rusthall, in the County of Kent, and the Right Honourable William Lord Abergavenny, and other Freehold Tenants of the said Manor, relating to certain Buildings and Enclosures made and erected in and upon Part of the Wastes of the said Manor; and for making the said Agreement effectual for the Purposes thereby intended." Hodie 1a vice lecta est Billa, intituled, "An Act for selling Part of the settled Estate of Henry Talbot Esquire, in the Counties of Warwick and Derby; and for settling another Estate, in the County of Rutland, of greater Value, to the same Uses." 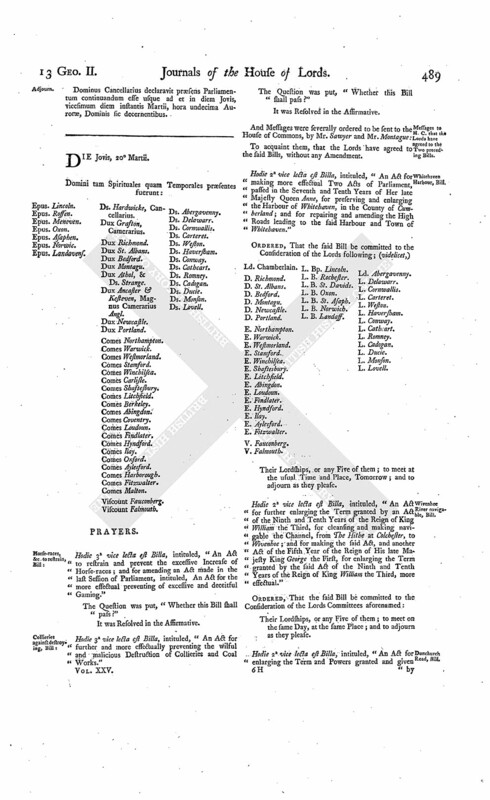 Ordered, That the Bill, intituled, "An Act for enlarging the Term and Powers granted by an Act made in the Twelfth Year of the Reign of His late Majesty King George, intituled, "An Act for repairing the Roads, in the Parishes of Kensington, Chelsea, and Fulham, and other Parishes therein mentioned, in the County of Middlesex; and for repairing some other Roads, in the Parish of St. George, Hanover Square, and the said Parishes of Kensington and Chelsea," be read the Third Time on the First Day of June next. The House being moved, "That Tuesday the 25th Day of this Instant March, may be appointed, for hearing the Cause wherein Dame Ellis Aylmer is Appellant, and Robert Reed Respondent:"
It is Ordered, That this House will hear the said Cause, by Counsel, at the Bar, on Tuesday the 25th Day of this Instant, as desired. The Lord Bathurst presented to the House a Bill, intituled, "An Act for exemplifying Wills and Deeds, and making the same Evidences." Ordered, That the same be printed, and read a Second Time on Friday next; the Lords to be summoned; and the Judges to attend. With a Bill, intituled, "An Act for making more effectual the Laws now in being, for disabling Persons from being chosen Members of, or sitting or voting in, the House of Commons, who have any Pension, during Pleasure, or for any Number of Years, or any Offices held in Trust for them;" to which they desire the Concurrence of this House. With a Bill, intituled, "An Act for the more effectual improving the Navigation of the River Dunn, from a Place called Wilsick House, in the Parish of Barmby Dun, in the County of York, to Fishlock Ferry, in the same County;" to which they desire the Concurrence of this House. With a Bill, intituled, "An Act for confirming and establishing Articles of Agreement, and an Award, for dividing and enclosing of a Common Down; and for dividing, enclosing and exchanging, of Lands lying in (fn. 2) the Tithing of Charlton, in the Parish of Andover, in the County of Southampton;" to which they desire the Concurrence of this House. With a Bill, intituled, "An Act for making Divisions, Enclosures, and Allotments, of the Open Corn Fields, and Common Pasture, in the Lordship of Bewholm, otherwise Bewham, in the Parish of Nunkeeling, in the County of York; and for settling and establishing the Payment of a Yearly Sum to the Impropriators of the Rectory of Nunkeeling aforesaid, and their Heirs, in Lieu of Tithes arising within the said Lordship, pursuant to an Agreement between the said Impropriators and the Proprietors of the said Lands;" to which they desire the Concurrence of this House. Ordered, That the first-mentioned Bill be read a Second Time on this Day Sevennight; and that the same be printed; and the Lords to be summoned. State of the Nation, to be considered. Ordered, That, on Thursday Sevennight, this House will take into Consideration the State of the Nation; and the Lords to be summoned; and that the Hearing of the Causes between the Earl of Selkirk and the Duke of Hamilton, appointed for that Day, be put off to the Day following, and the Cause on that Day to the Monday after, and the other Causes on Cause-days to be removed in Course. Clandestine Mariages, to prevent, Bill. The House (according to Order) was adjourned during Pleasure, and put into a Committee upon the Bill for the more effectual preventing clandestine Marriages. Ordered, That the House be put into a Committee again, on the said Bill, on the First Day of June next. 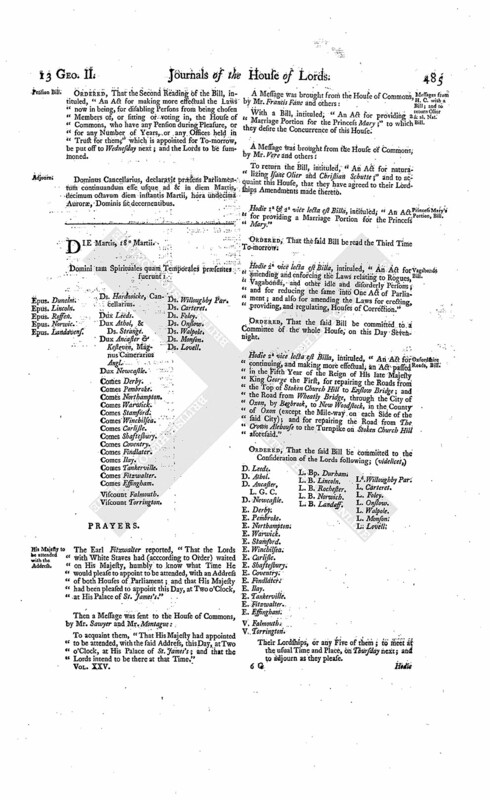 The Order of the Day being read, for the House to be put into a Committee upon the Bill, intituled, "An Act for confirming and enlarging the Powers granted by His Majesty to the Governors and Guardians of the Hospital for the Maintenance and Education of exposed and deserted young Children, by His most Gracious Charter, bearing Date the 17th Day of October in the Year of our Lord One Thousand Seven Hundred and Thirty-nine; and to enable them to execute the good Purposes of the said Charter. Hodie 2a vice lecta est Billa, intituled, "An Act for confirming and establishing certain Articles of Agreement, made between Maurice Conyers Esquire, Lord of the Manor of Rusthall, in the County of Kent, and the Right Honourable William Lord Abergavenny, and other Freehold Tenants of the said Manor, relating to certain Buildings and Enclosures made and erected in and upon Part of the Wastes of the said Manor; and for making the said Agreement effectual for the Purposes thereby intended." Viscount Torrington. L. Bp. Ro'hester. Their Lordships, or any Five of them; to meet at the usual Time and Place, on Thursday the 27th Instant; and to adjourn as they please. Hodie 2a vice lecta est Billa, intituled, "An Act for selling Part of the settled Estate of Henry Talbot Esquire, in the Counties of Warwick and Derby; and for settling another Estate, in the County of Rutland, of greater Value, to the same Uses." Hodie 2a vice lecta est Billa, intituled, "An Act for making Divisions, Enclosures, and Allotments, of the Open Corn Fields and Common Pasture, in the Lordship of Bewholm, otherwise Bewham, in the Parish of Nunkeeling, in the County of York; and for settling and establishing the Payment of a Yearly Sum to the Impropriators of the Rectory of Nunkeeling aforesaid, and their Heirs, in Lieu of Tithes arising within the said Lordship, pursuant to an Agreement between the said Imporpriators and the Proprietors of the said Lands." Their Lordships, or any Five of them; to meet at the usual Time and Place, on Wednesday the 26th Instant; and to adjourn as they please. Hodie 2a vice lecta est Billa, intituled, "An Act for confirming and establishing Articles of Agreement, and an Award, for dividing and enclosing of a Common Down; and for dividing, enclosing, and exchanging, of Lands, lying in the Tithing of Charlton, in the Parish of Andover, in the County of Southampton." Hodie 2a vice lecta est Billa, intituled, An Act for the more effectual improving the Navigation of the River Dun, from a Place called Wilsick House, in the Parish of Barmby Dun, in the County of York, to Fishlock Ferry, in the same County." Judges to attend, on general Register Bill. Ordered, That the Judges do attend this House To-morrow, when their Lordships are to be in a Committee, upon the Bill, intituled, "An Act for the public Registering of Deeds, Conveyances, and Encumbrances, that shall be made of, or may affect, Honours, Manors, Lands, Tenements, or Hereditaments, within that part of Great Britain called England, and the Dominion of Wales." The House being informed, "That a Person attended, in order to deliver in certain Papers, Pleadings, and Proceedings, in the Cause wherein William Ashworth is Appellant, and Richard Chopping is Respondent:"
He was called in; and delivered, at the Bar, the said Papers, Pleadings, and Proceedings; and attested upon Oath, "The same were true Copies; he having examined them with the Originals in the proper Offices in Ireland." Ordered, That the Cause wherein John Earl of Selkirk and Ruglen is Appellant, and James Duke of Hamilton and Brandon Respondent, et è contra, do stand peremptorily to be heard at the Time it now stands appointed. Counsel (according to Order) were called in, to be heard, upon the Petition and Appeal of Joseph Nagle Esquire; complaining of certain Orders of the Court of Exchequer in Ireland, of the 29th of January 1738, and the 15th and 23d of February following; to which Appeal, George Foot, Penelope Purdon Widow, and Courthope Clayton Esquire, are Respondents. And the Appellant's Counsel being, by the Direction of the House, required to speak to this Point only, "Whether an Appeal will lie from an Order of a Court of Equity to shew Cause, before the same be made absolute?" 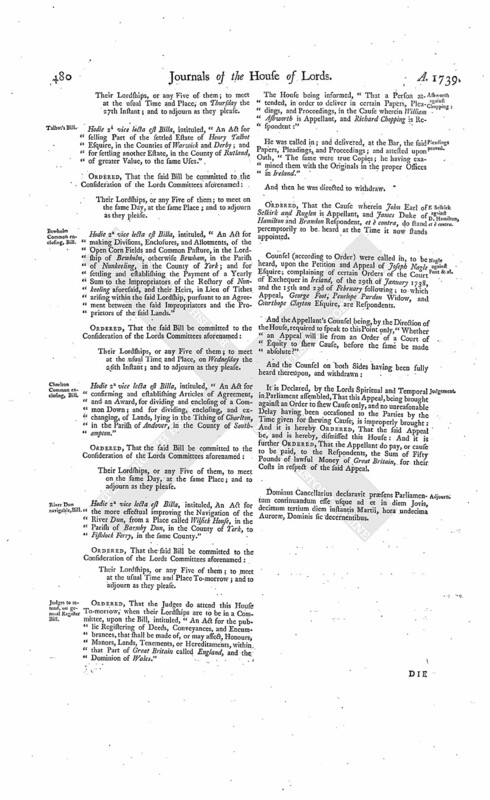 It is Declared, by the Lords Spiritual and Temporal in Parliament assembled, That this Appeal, being brought against an Order to shew Cause only, and no unreasonable Delay having been occasioned to the Parties by the Time given for shewing Cause, is improperly brought: And it is hereby Ordered, That the said Appeal be, and is hereby, dismissed this House: And it is further Ordered, That the Appellant do pay, or cause to be paid, to the Respondents, the Sum of Fifty Pounds of lawful Money of Great Britain, for their Costs in respect of the said Appeal. Horse-races, &c. to restrain, Bill. 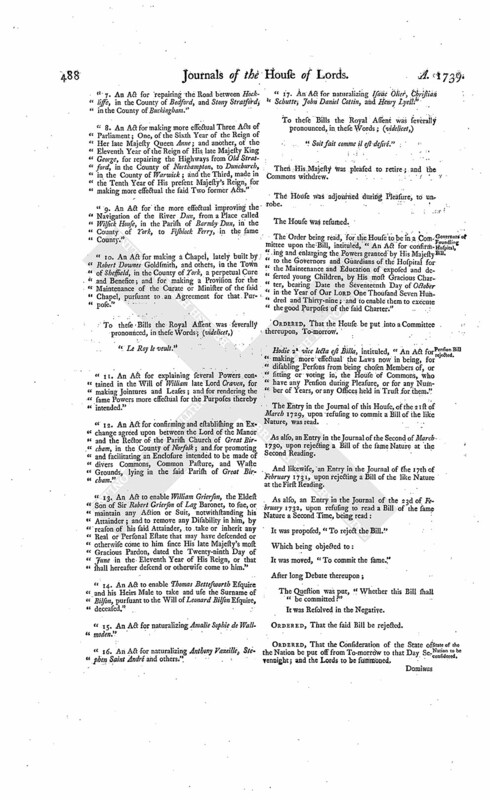 With a Bill, intituled, "An Act to restrain and prevent the excessive Increase of Horse-races; and for amending an Act made in the last Session of Parliament, intituled, An Act for the more effectual preventing of excessive and deceitful Gaming;" to which they desire the Concurrence of this House. Destruction of Colleries to prevent, Bill. With a Bill, intituled, "An Act for further and more effectually preventing the wilful and malicious Destruction of Collieries and Coal-works;" to which they desire the Concurrence of this House. The Earl of Warwick reported from the Lords Committees to whom the Bill, intituled, "An Act for the more effectual improving the Navigation of the River Dun, from a Place called Wilsick House, in the Parish of Barmby Dun, in the County of York, to Fishlock Ferry, in the same County," was committed: "That they had considered the said Bill, and examined the Allegations thereof, which they found to be true; and that the Committee had gone through the Bill, and directed him to report the same to the House, without any Amendment." The House being informed, "That Mr. Arnold, Deputy Secretary at War, attended:"
The House (according to Order) was adjourned during Pleasure, and put into a Committee upon the Bill, intituled, "An Act for the public Registering of Deeds, Conveyances, and Encumbrances, that shall be made of, or that may affect, Honours, Manors, Lands, Tenements, and Hereditaments, within that Part of Great Britain called England, and the Dominion of Wales." Ordered, That the House be put into a Committee again, upon the said Bill, To-morrow; the Lords to be summoned; and the Judges to attend. Ordered, That the Cause wherein Sir James Cunyngham Baronet is Appellant, and Captain John Chalmer and others are Respondents, which stands appointed for To-morrow, be put off to that Day Sevennight; and that the Cause wherein John Earl of Selkirk and Ruglen is Appellant, and James Duke of Hamilton and Brandon Respondent, et è contra, appointed for that Day, be put off to the Monday following; and the other Causes on Cause days removed in Course. Dux Ancaster & Kesteven, Magnus Camorarius Angl. With a Bill, intituled, "An Act for amending and enforcing the Laws relating to Rogues, Vagabonds, and other idle and disorderly Persons; and for reducing the same into One Act of Parliament; and also for amending the Laws for erecting, providing, and regulating, Houses of Correction;" to which they desire the Concurrence of this House. Hodie 2a vice lecta est Billa, intituled, "An Act to restrain and prevent the excessive Increase of Horseraces; and for amending an Act made in the last Session of Parliament, intituled, An Act for the more effectual preventing of excessive and deceitful Gaming." Destruction of Collieries to prevent, Bill. Hodie 2a vice lecta est Billa, intituled, "An Act for further and more effectually preventing the wilful and malicious Destruction of Collieries and Coalworks." Hodie 2a vice lecta est Billa, intituled, "An Act for exemplifying Wills and Deeds, and making the same Evidences." Ordered, That the said Bill be committed to a Committee of the whole House, on Thursday next; and that the Judges do then attend. 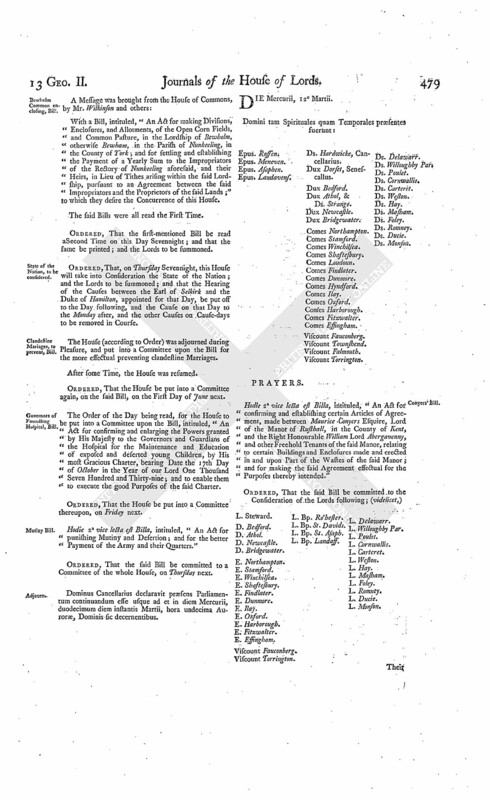 The Order being read, for the House to be put into a Committee upon the Bill, intituled, "An Act for confirming and enlarging the Powers granted by His Majesty to the Governors and Guardians of the Hospital for the Maintenance and Education of exposed and deserted young Children, by His most Gracious Charter, bearing Date the Seventeenth Day of October in the Year of our Lord One Thousand Seven Hundred and Thirty-nine; and to enable them to execute the good Purposes of the said Charter." Hodie 3a vice lecta est Billa, intituled, "An Act for the more effectual improving the Navigation of the River Dun, from a Place called Wilsick House, in the Parish of Barmby Dun, in the County of York, to Fishlock Ferry, in the same County." The House (according to Order) was adjourned during Pleasure, and put into a Committee again upon the Bill, intituled, "An Act for the Public Registering of Deeds, Conveyances, and Encumbrances, that shall be made of, or may affect, Honors, Manors, Lands, Tenements, or Hereditaments, within that Part of Great Britain called England, and the Dominion of Wales." And the Earl of Warwick reported from the said Committee, "That they had made a further Progress in the Bill; and that he was directed to move the House, to order the Judges to prepare a Clause, or Clauses, for fixing the Office of General Register in the Enrolment-office in the Court of Chancery, under the Direction and Control of the Master of the Rolls for the Time being, subject to the Superintendency of the Lord Chancellor, Lord Keeper or Lords Commissioners of the Great Seal, for the Time being; and also a Proviso, or Provisoes, declaring Judgements, Statutes, and Recognizances, not to be Encumbrances, to be registered within the Meaning of this Bill; and also a Clause, or Clauses, directing, that the Forfeiture of the Office of Register shall be a Forfeiture of the Office of Clerk of the Peace, in any County or Division, and of any Office to which the Duties of the Office of Clerk of the Peace shall respectively belong, in Cities, and Towns and Counties of the same; and that the Officer shall be removeable from the same, by such Person or Persons as have now Authority by Law to remove such Clerk of the Peace, or Officer exercising the Duties of Clerk of the Peace, respectively, and by the like Methods of Proceeding." The said Motion, being read by the Clerk, was agreed to. Ordered, That the Judges do prepare a Clause, or Clauses, pursuant thereunto. Ordered, That the House be put into a Committee again on the said Bill, on Monday next; the Lords to be summoned; and the Judges to attend. Ordered, That the Cause wherein George Hartpole Esquire is Appellant, and Hunt Walsh et al. are Respondents, appointed for Monday next, be put off to Wednesday Sevennight; and the Cause appointed for that Day to the Friday following; and the other Causes on Cause-days removed in Course. With a Bill, intituled, "An Act for continuing and making more effectual an Act passed in the Fifth Year of the Reign of His late Majesty King George the First, for repairing the Roads from the Top of Stoken Church Hill to Enslow Bridge, and the Road from Wheatly Bridge, through the City of Oxon, by Begbrook, to New Woodstock, in the County of Oxon (except the Mile-way on each Side of the said City); and for repairing the Road from The Crown Alehouse, to the Turnpike on Stoken Church Hill aforesaid;" to which they desire the Concurrence of this House. Lord King takes his Seat. Peter Lord King sat first in Parliament after the Death of his Brother John Lord King; having, at the Table, taken the Oaths, and made and subscribed the Declaration, and also taken and subscribed the Oath of Abjuration, pursuant to the Statutes. The Earl of Warwick reported from the Lords Committees to whom the Bill, intituled, "An Act for establishing and confirming an Agreement between William Gore Esquire, Executor of Edward Gore Esquire, deceased, and Mary Gore Widow of Thomas Gore Esquire, deceased, for herself and on the Behalf of Charles Gore an Infant, relating to the Sum of Three Thousand Pounds, paid by Francis Freeman Gentleman, to the said Edward Gore," was committed: That they had considered the said Bill, and examined the Allegations thereof, which they found to be true; that the Parties concerned had given their Consents; and that the Committee had gone through the Bill, and made some Amendments thereunto." The House being moved, "That a Day may be appointed, for hearing the Cause wherein Sir William Barker Baronet is Appellant, and Thomas Ivers Respondent:"
The House (according to Order) was adjourned during Pleasure, and put into a Committee upon the Bill, intituled, "An Act for the public Registering of Deeds, Conveyances, and Encumbrances, that shall be made of, or may affect, Honors, Manors, Lands, Tenements, or Hereditaments, within that Part of Great Britain called England, and the Dominion of Wales." And the Earl of Warwick reported from the said Committee, "That they had made a further Progress in the said Bill." Ordered, That the House be put into a Committee again thereupon, on Wednesday next; the Lords to be summoned; and the Judges to attend. Address on Admiral Vernon's Success in The West Indies. Ordered, That an humble Address be presented to His Majesty, to congratulate His Majesty on the happy Success of His Majesty's Arms, under the Command of Vice Admiral Vernon in The West Indies. Then the Lords present were appointed a Committee, to draw an Address pursuant to the said Order; and report to the House. Message to H. C. to fit. To desire that they will continue sitting for some Time. "We, Your Majesty's most dutiful and loyal Subjects, the Lords Spiritual and Temporal, in Parliament assembled, do congratulate Your Majesty, on the glorious Success of Your Majesty's Arms in The West Indies, under the Command of Vice Admiral Vernon, by entering the Port and taking the Town of Porto Bello, and demolishing and leveling all the Forts and Castles belonging thereto. This Enterprize, so wisely concerted, and so bravely conducted, cannot fail of giving the utmost Joy to all Your Majesty's faithful Subjects, since it affords the most reasonable Hopes and Expectations that, by the Blessing of God upon Your Majesty's Councils and Arms, it may be attended with other important Advantages, and highly contribute to the obtaining effectual Security of those just Rights of Navigation and Commerce belonging to Your Majesty's Subjects, for the Preservation of which Your Majesty entered into this necessary War." The said Address was read by the Clerk entire, and afterwards by Paragraphs. And the First Paragraph, being read a Second Time, was agreed to. Then the Second Paragraph was again read; and, after the Word ["obtaining,"] and before the Word ["effectual"], it was agreed to insert these Words ["real and"]; and then the same was agreed to. Ordered, That the said Address be communicated to the Commons, and their Concurrence therein desired. Message to H. C. to desire their Concurrence to it. To acquaint them, that the Lords have agreed to an Address to be presented to His Majesty; to which their Lordships desire their Concurrence. To return the said Address; and to acquaint this House, "That they have agreed to the same, by filling up the Blank with the Words ["and Commons;"] and with an Amendment, by adding, after the Word ["thereto"], at the End of the First Paragraph, these Words [" with Six Ships of War only"]." Then the said Amendment, being read, was agreed to by the House. His Majesty to be attended with it. Ordered, That the Lords with White Staves do wait on His Majesty, humbly to know what Time He will be pleased to appoint to be attended, with an Address of both Houses of Parliament. 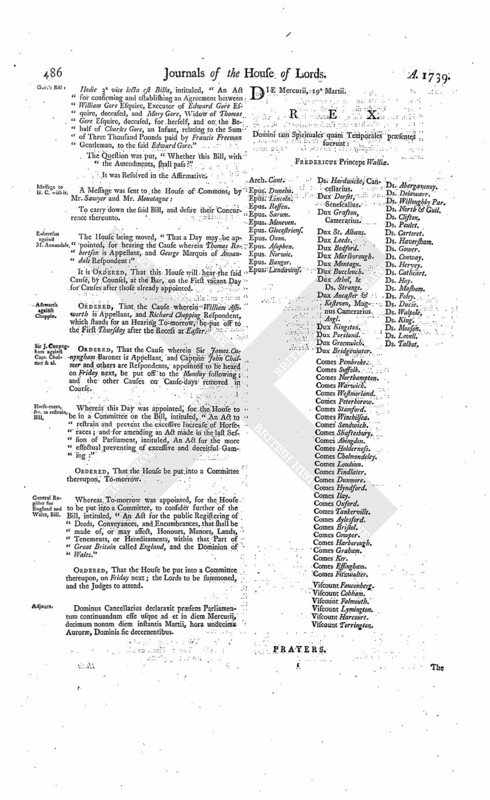 Ordered, That the Second Reading of the Bill, intituled, "An Act for making more effectual the Laws now in being, for disabling Persons from being chosen Members of, or sitting or voting in, the House of Commons, who have any Pension during Pleasure, or for any Number of Years, or any Offices held in Trust for them," which is appointed for To-morrow, be put off to Wednesday next; and the Lords to be summoned. Dominus Cancellarius, declaravit præsens Parliamentum continuandum esse usque ad & in diem Martis, decimum octavum diem instantis Martii, hora undecima Auroræ, Dominis sic decernentibus. The Earl Fitzwalter reported, "That the Lords with White Staves had (according to Order) waited on His Majesty, humbly to know what Time He would please to appoint to be attended, with an Address of both Houses of Parliament; and that His Majesty had been pleased to appoint this Day, at Two o'Clock, at His Palace of St. James's." To acquaint them, "That His Majesty had appointed to be attended, with the said Address, this Day, at Two o'Clock, at His Palace of St. James's; and that the Lords intend to be there at that Time." Messages from H. C. with a Bill; and to return Olier & al. Nat. Bill. With a Bill, intituled, "An Act for providing a Marriage Portion for the Princess Mary;" to which they desire the Concurrence of this House. To return the Bill, intituled, "An Act for naturalizing Isaac Olier and Christian Schutte;" and to acquaint this House, that they have agreed to their Lordships Amendments made thereto. Hodie 1a & 2a vice lecta est Billa, intituled, "An Act for providing a Marriage Portion for the Princess Mary." Hodie 2a vice lecta est Billa, intituled, "An Act for amending and enforcing the Laws relating to Rogues, Vagabonds, and other idle and disorderly Persons; and for reducing the same into One Act of Parliament; and also for amending the Laws for erecting, providing, and regulating, Houses of Correction." Hodie 2a vice lecta est Billa, intituled, "An Act for continuing, and making more effectual, an Act passed in the Fifth Year of the Reign of His late Majesty King George the First, for repairing the Roads from the Top of Stoken Church Hill to Enslow Bridge; and the Road from Wheatly Bridge, through the City of Oxon, by Begbrook, to New Woodstock, in the County of Oxon (except the Mile-way on each Side of the said City); and for repairing the Road from The Crown Alehouse to the Turnpike on Stoken Church Hill aforesaid." V. Torrington. L. Bp. Durham. L. B. Landaff. Ld. Willoughby Par. Hodie 3a vice lecta est Billa, intituled, "An Act for confirming and establishing an Agreement between William Gore Esquire, Executor of Edward Gore Esquire, deceased, and Mary Gore, Widow of Thomas Gore Esquire, deceased, for herself, and on the Behalf of Charles Gore, an Infant, relating to the Sum of Three Thousand Pounds paid by Francis Freeman Gentleman, to the said Edward Gore." The House being moved, "That a Day may be appointed, for hearing the Cause wherein Thomas Robertson is Appellant, and George Marquis of Annandale Respondent:"
Ordered, That the Cause wherein William Ashworth is Appellant, and Richard Chopping Respondent, which stands for an Hearing To-morrow, be put off to the First Thursday after the Recess at Easter. Ordered, That the Cause wherein Sir James Cunyngham Baronet is Appellant, and Captain John Chalmer and others are Respondents, appointed to be heard on Friday next, be put off to the Monday following; and the other Causes on Cause days removed in Course. 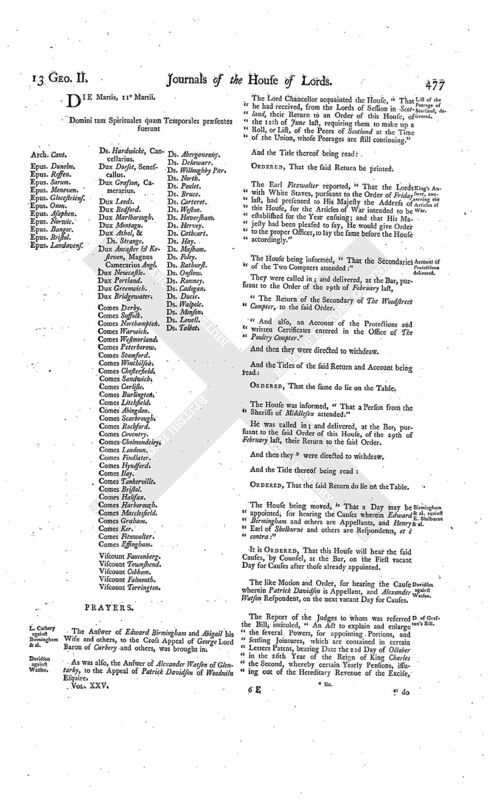 Whereas this Day was appointed, for the House to be in a Committee on the Bill, intituled, "An Act to restrain and prevent the excessive Increase of Horseraces; and for amending an Act made in the last Session of Parliament, intituled, An Act for the more effectual preventing of excessive and deceitful Gaming:"
Whereas To-morrow was appointed, for the House to be put into a Committee, to consider further of the Bill, intituled, "An Act for the public Registering of Deeds, Conveyances, and Encumbrances, that shall be made of, or may affect, Honours, Manors, Lands, Tenements, or Hereditaments, within that Part of Great Britain called England, and the Dominion of Wales." Ordered, That the House be put into a Committee thereupon, on Friday next; the Lords to be summoned, and the Judges to attend. Dominus Cancellarius declaravit præsens Parliamentum continuandum esse usque ad et in diem Mercurii, decimum nonum diem instantis Martii, hora undecima Auroræ, Dominis sic decernentibus. King's Answer to Address about Admiral Vernon. "I thank you for your dutiful Congratulations on this Success, which is so much for the Honour and Interest of My Crown and Kingdoms. The Satisfaction you express in the Measures I have taken is very agreeable to Me." Ordered, That the said Address, with His Majesty's most Gracious Answer thereunto, be forthwith printed and published. With a Bill, intituled, "An Act for making more effectual Two Acts of Parliament, passed in the Seventh and Tenth Years of Her late Majesty Queen Anne, for preserving and enlarging the Harbour of Whitehaven, in the County of Cumberland; and for amending and repairing the High Roads leading to the said Harbour and Town of Whitehaven;" to which they desire the Concurrence of this House. With a Bill, intituled, "An Act for enlarging the Term and Powers granted and given by an Act passed in the Tenth Year of the Reign of His late Majesty King George the First, intituled, "An Act for repairing the Road leading from Dunchurch, in the County of Warwick, to the Bottom of Meriden Hill, in the same County; and for making the said Act more effectual;" to which they desire the Concurrence of this House. The House (according to Order) was adjourned during Pleasure, and put into a Committee upon the Bill, intituled, "An Act for further and more effectually preventing the wilful and malicious Destruction of Collieries and Coal Works." The House (according to Order) was adjourned during Pleasure, and put into a Committee upon the Bill, intituled, "An Act to restrain and prevent the excessive Increase of Horse-races; and for amending an Act made in the last Session of Parliament, intituled, An Act for the more effectual preventing of excessive and deceitful Gaming." Hodie 3a vice lecta est Billa, intituled, "An Act for providing a Marriage Portion for the Princess Mary." His Majesty, being seated on the Throne, with the accustomed Ceremonies; the Prince of Wales, in his Robes, sitting in his Place; and the Lords being also in their Robes; commanded the Gentleman Usher of the Black Rod to let the Commons know, "It is His Majesty's Pleasure, that they attend Him immediately, in this House." "1. An Act for providing a Marriage Portion for the Princess Mary." "Le Roy remercie ses bons Subjects, accepte leur Benevolence, et ainsi le veult." "2. An Act for the more effectual securing and encouraging the Trade of His Majesty's British Subjects to America; and for the Encouragement of Seamen to enter into His Majesty's Service." "3. An Act for naturalizing such Foreign Protestants, and others therein mentioned, as are settled, or shall settle, in any of His Majesty's Colonies in America." "4. An Act for punishing Mutiny and Desertion, and for the better Payment of the Army and their Quarters." "5. An Act to explain and amend an Act made in the First Year of the Reign of Her late Majesty Queen Anne, intituled, An Act for the more effectual preventing the Abuses and Frauds of Persons employed in the working up the Woollen, Linen, Fustian, Cotton, and Iron Manufactures of this Kingdom; and for extending the said Act to the Manufactures of Leather." "6. An Act to indemnify Persons who have omitted to qualify themselves for Offices and Employments within the Time limited by Law; and for allowing further Time for that Purpose." "7. An Act for repairing the Road between Hockliffe, in the County of Bedford, and Stony Stratford, in the County of Buckingham." "8. An Act for making more effectual Three Acts of Parliament; One, of the Sixth Year of the Reign of Her late Majesty Queen Anne; and another, of the Eleventh Year of the Reign of His late Majesty King George, for repairing the Highways from Old Stratford, in the County of Northampton, to Dunchurch, in the County of Warwick; and the Third, made in the Tenth Year of His present Majesty's Reign, for making more effectual the said Two former Acts." "9. An Act for the more effectual improving the Navigation of the River Dun, from a Place called Wilsick House, in the Parish of Barmby Dun, in the County of York, to Fishlock Ferry, in the same County." "10. An Act for making a Chapel, lately built by Robert Downes Goldsmith, and others, in the Town of Sheffield, in the County of York, a perpetual Cure and Benefice; and for making a Provision for the Maintenance of the Curate or Minister of the said Chapel, pursuant to an Agreement for that Purpose." "11. An Act for explaining several Powers contained in the Will of William late Lord Craven, for making Jointures and Leases; and for rendering the same Powers more effectual for the Purposes thereby intended." "12. 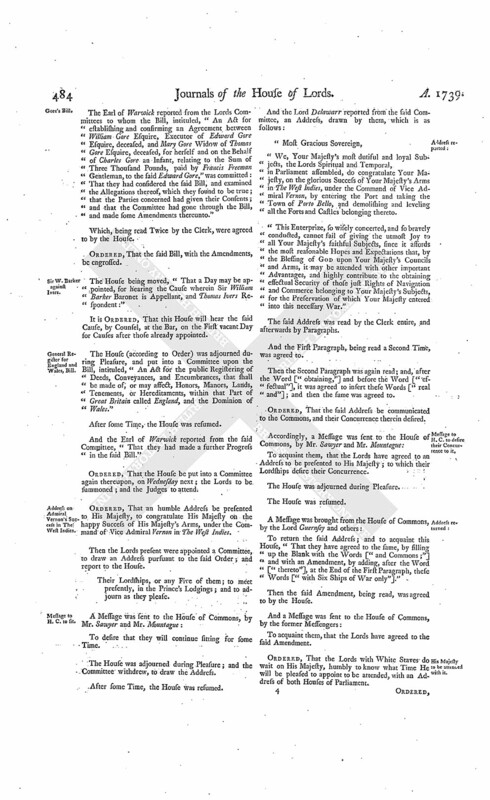 An Act for confirming and establishing an Exchange agreed upon between the Lord of the Manor and the Rector of the Parish Church of Great Bircham, in the County of Norfolk; and for promoting and facilitating an Enclosure intended to be made of divers Commons, Common Pasture, and Waste Grounds, lying in the said Parish of Great Bircham." "13. An Act to enable William Grierson, the Eldest Son of Sir Robert Grierson of Lag Baronet, to sue, or maintain any Action or Suit, notwithstanding his Attainder; and to remove any Disability in him, by reason of his said Attainder, to take or inherit any Real or Personal Estate that may have descended or otherwise come to him since His late Majesty's most Gracious Pardon, dated the Twenty-ninth Day of June in the Eleventh Year of His Reign, or that shall hereafter descend or otherwise come to him." "14. An Act to enable Thomas Bettesworth Esquire and his Heirs Male to take and use the Surname of Bilson, pursuant to the Will of Leonard Bilson Esquire, deceased." "15. An Act for naturalizing Amalie Sophie de Wallmoden." "16. An Act for naturalizing Anthony Vazeille, Stephen Saint André and others." "17. An Act for naturalizing Isaac Olier, Chistian Schutte, John Daniel Cottin, and Henry Lyell." 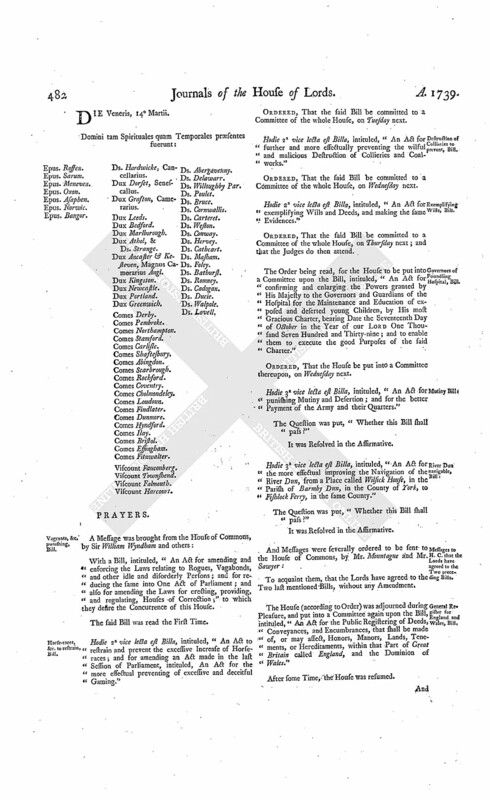 The Order being read, for the House to be in a Committee upon the Bill, intituled, "An Act for confirming and enlarging the Powers granted by His Majesty to the Governors and Guardians of the Hospital for the Maintenance and Education of exposed and deserted young Children, by His most Gracious Charter, bearing Date the Seventeenth Day of October in the Year of Our Lord One Thousand Seven Hundred and Thirty-nine; and to enable them to execute the good Purposes of the said Charter." Hodie 2a vice lecta est Billa, intituled, "An Act for making more effectual the Laws now in being, for disabling Persons from being chosen Members of, or sitting or voting in, the House of Commons, who have any Pension during Pleasure, or for any Number of Years, or any Offices held in Trust for them." The Entry in the Journal of this House, of the 21st of March 1729, upon refusing to commit a Bill of the like Nature, was read. As also, an Entry in the Journal of the Second of March 1730, upon rejecting a Bill of the same Nature at the Second Reading. And likewise, an Entry in the Journal of the 17th of February 1731, upon rejecting a Bill of the like Nature at the First Reading. It was proposed, "To reject the Bill." It was moved, "To commit the same." Ordered, That the Consideration of the State of the Nation be put off from To-morrow to that Day Sevennight; and the Lords to be summoned. Dominus Cancellarius declaravit præsens Parliamentum continuandum esse usque ad et in diem Jovis, vicesimum diem instantis Martii, hora undecima Auroræ, Dominis sic decernentibus. Hodie 3a vice lecta est Billa, intituled, "An Act to restrain and prevent the excessive Increase of Horse-races; and for amending an Act made in the last Session of Parliament, intituled, An Act for the more effectual preventing of excessive and deceitful Gaming." Hodie 3a vice lecta est Billa, intituled, "An Act for further and more effectually preventing the wilful and malicious Destruction of Collieries and Coal Works." Hodie 2a vice lecta est Billa, intituled, "An Act for making more effectual Two Acts of Parliament, passed in the Seventh and Tenth Years of Her late Majesty Queen Anne, for preserving and enlarging the Harbour of Whitehaven, in the County of Cumberland; and for repairing and amending the High Roads leading to the said Harbour and Town of Whitehaven." V. Falmouth. L. Bp. Lincoln. Their Lordships, or any Five of them; to meet at the usual Time and Place, Tomorrow; and to adjourn as they please. Hodie 2a vice lecta est Billa, intituled, "An Act for further enlarging the Term granted by an Act of the Ninth and Tenth Years of the Reign of King William the Third, for cleansing and making navigable the Channel, from The Hithe at Colchester, to Wivenhoe; and for making the said Act, and another Act of the Fifth Year of the Reign of His late Majesty King George the First, for enlarging the Term granted by the said Act of the Ninth and Tenth Years of the Reign of King William the Third, more effectual." Hodie 2a vice lecta est Billa, intituled, "An Act for enlarging the Term and Powers granted and given by an Act passed in the Tenth Year of the Reign of His late Majesty King George the First, intituled, An Act for repairing the Road leading from Dunchurch, in the County of Warwick, to the Bottom of Meriden Hill, in the same County; and for making the said Act more effectual." The Order being read, for the House to be in a Committee on the Bill, intituled, "An Act for exemplifying Wills and Deeds, and making the same Evidences:"
Ordered, That the House be put into a Committee thereupon; To-morrow Sevennight; the Lords to be summoned; and the Judges to attend. The House being moved, "That the several Proceedings entered in the Journal of this House, the last Session of Parliament, upon the Complaint of Hugh Lord Viscount Primrose's being arrested, and detained in Custody, at the Suit of John White, in Breach of his Lordship's Privilege of Peerage, might be read:"
The same were read accordingly. And it being moved, "That the Order, made the 26th of February 1738, for taking the said White into Custody, might be revived; he having absconded, and could not be taken:"
White to be attached, for arresting him. Ordered, That the Serjeant at Arms attending this House, his Deputy or Deputies, do forthwith attach the Body of the said John White, and bring him to this House, to answer for his Offence; and this shall be a sufficient Warrant in that Behalf. To Francis Jephson Esquire, Serjeant at Arms attending this House, his Deputy or Deputies, and every of them; and all Sheriffs, Mayors, Bailiffs, Headboroughs, Constables, and other His Majesty's loving Subjects, are to be aiding and assisting in the Execution hereof. 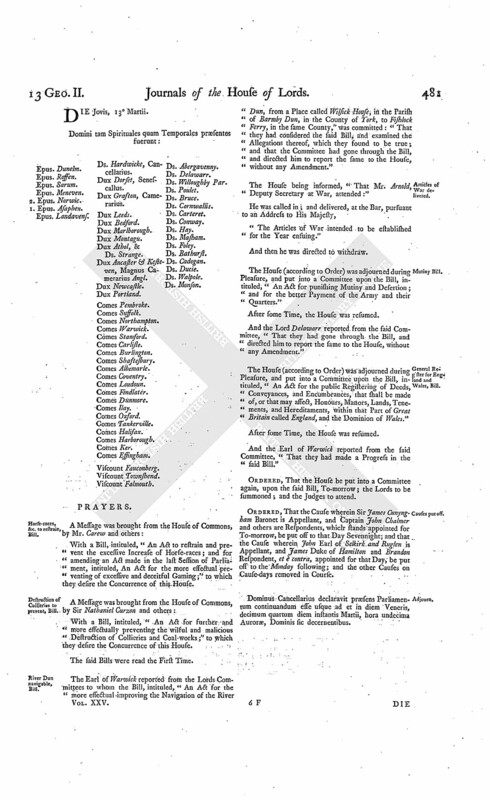 The House (according to Order) was adjourned during Pleasure, and put into a Committee upon the Bill, intituled, "An Act for confirming and enlarging the Powers granted by His Majesty to the Governors and Guardians of the Hospital for the Maintenance and Education of exposed and deserted young Children, by His most Gracious Charter, bearing Date the Seventeenth Day of October in the Year of our Lord One Thousand Seven Hundred and Thirty-nine; and to enable them to execute the good Purposes of the said Charter." And the Lord Lovell reported from the said Committee, "That they had gone through the Bill, and made One Amendment thereunto; which he was directed to report, when the House will please to receive the same." Clauses to be added to the Register Bill. 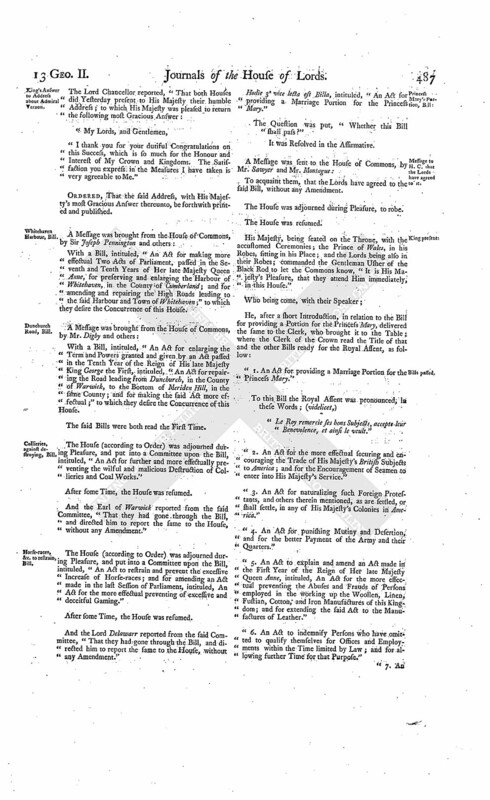 Ordered, That the Judges do prepare a Clause, or Clauses, to be laid before the Committee of the whole House to whom the Bill for the public Registering of Deeds, Conveyances, and Encumbrances, stands committed, for annexing the Office of General Register, therein mentioned to the Office of the Master of the Rolls, with such Powers and Provisions, as to the Place and Manner of executing the same, as to them shall seem proper. 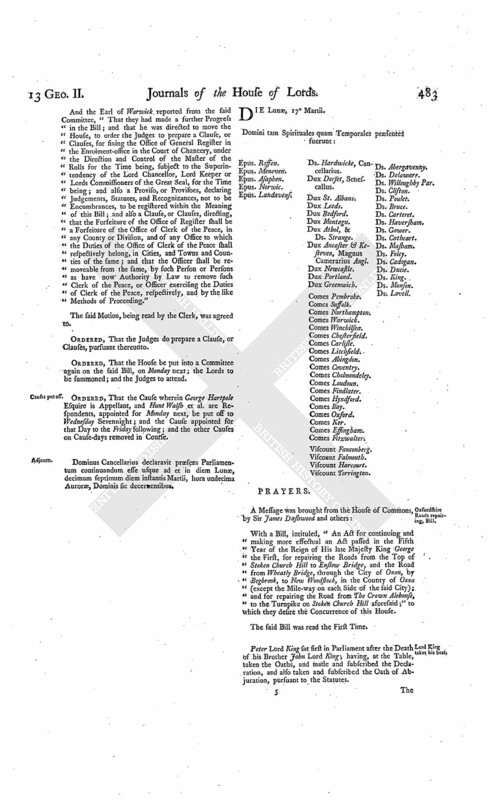 Whereas Tuesday next is appointed, for the House to be in a Committee upon the Bill, intituled, "An Act for amending and enforcing the Laws relating to Rogues, Vagabonds, and other idle and disorderly Persons; and for reducing the same into One Act of Parliament; and also for amending the Laws for erecting, providing, and regulating, Houses of Correction:"
Ordered, That the House be put into a Committee upon the said Bill, on this Day Sevennight; and that the same be forthwith printed. Upon reading the Petition and Appeal of Samuel Forbes of Knappernie; complaining of several Interlocutors of the Lords of Session in Scotland, of the 28th of July 1730, 25th of June 1736, 7th of January 1736/7, 23d of December 1737, 13th of January 1737/8, 13th and 23d of November and 19th of December, 1739, and 29th of February last, made on the Behalf of James Walkinshaw of Walkinshaw; and praying, "That the said Interlocutors, so far as they are recited in the said Appeal, may be reversed, altered, or varied; or that the Appellant may have such Relief as to the House shall seem meet:"
It is Ordered, That the said James Walkinshaw may have a Copy of the said Appeal; and he is hereby required to put in his Answer thereunto, in Writing, on or before Thursday the 17th Day of April next; and that Service of this Order upon any One of his Counsel or Agents in the Court below shall be deemed good Service. Dominus Cancellarius declaravit præsens Parliamentum continuandum esse usque ad et in diem Veneris, vicesimum primum diem instantis Martii, hora undecima Auroræ, Dominis sic decernentibus.